Call it Stockholm Syndrome, poor judgment brought on by lowered standards, or a boiling rage against all of Disney and a desire to see it burn to the ground. 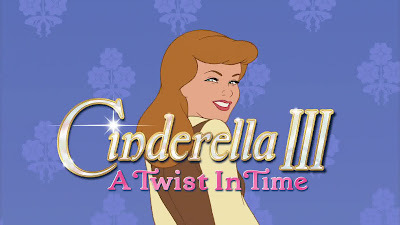 Whatever the reason, I was actually quite taken with Cinderella III: A Twist in Time. To save my very soul, I don't think I could say if it's for ironic reasons or not. 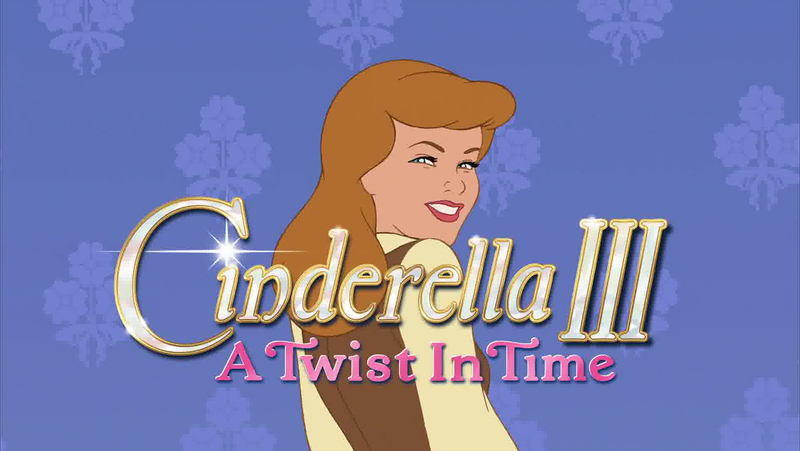 None of which is necessarily all that shameful: A Twist in Time is generally regarded as one of the better DisneyToon Studios sequels, even as it came out in the twilight of their existence (released in February, 2007, it was the last such release prior to John Lasseter's official announcement that he was shuttering the DTV sequels program). The shameful part is that I honestly think I even like it better than Cinderella itself (though I'm certainly not the world's foremost Cinderella fan). Not, Lord knows, because it is better, for it isn't. But it is considerably more fucked up; it is among the most fucked-up animated movies that Disney ever put its name to, in fact, and as some of us are inclined to respond a bit too positively to certain things mostly because they are so invested in their own weirdness that they don't even seem to register how weird they are, I think I kind of love A Twist in Time not for its animation (which is troublesome), its songs (which are insipid), or its story (which is utterly daft), but because of the incredibly vigorous shits it does not give about whether any of these things are working or not. Completely disregarding the events (though not all of the characters) of Cinderella II: Dreams Come True - and this is an unmistakably good decision to have made - A Twist in Time opens on the first wedding anniversary of scullery maid-turned-princess Cinderella (Jennifer Hale) and her deeply uninteresting Prince Charming (Christopher Daniel Barnes), with Cinderella narrating about how excellent her life has been. To us, apparently, though it quickly becomes clear that her narration is diegetic, and at no point does anyone break the fourth wall in the whole movie. So perhaps she just walks around the castle all day every day prattling to nobody about how totally amazing her life is. God knows she's full of herself enough for that, based on the first 30 seconds of the movie in which she describes her life - in song! - as "perfectly perfect", and flashes the smuggest little grin you could imagine right at the camera, just to rub it in that she is that much better than we are. And it's also within that 30 seconds that it becomes absolutely clear how very far we are from 1950. Hale, having at least pretended to do an Ilene Woods impression in Dreams Come True, has catapulted into "hey girl, it's the 21st Century" mode, chatting at us with a laughing, self-aware tone that she's willfully stolen from Paige O'Hara's Belle, of Beauty and the Beast. And it doesn't end there: the opening song, "Perfectly Perfect" (written, like all of the film's originals, by Alan Zachary and Michael Weiner) is an overt attempt to copy the "build a world through song" Broadway number that, in Disney, is exemplified by "Belle". 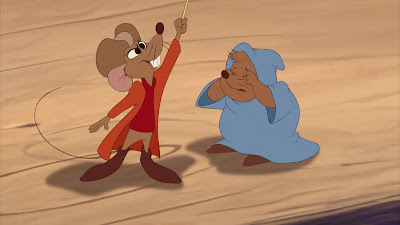 And so it is that we learn just how nauseatingly happy Cinderella is, and so are her little mice friends Jaq (Rob Paulsen) and Gus (Corey Burton), and so is her fairy godmother (Russi Taylor). Not remotely happy are her step-sisters, Anastasia (Tress MacNeille) and Drizella (Taylor again), who can't stand having to do their own housework now, though it's not clear to me why they can't just hire a maid; it's not like having Cinderella serve in the household was a cost-saving measure, it was all about humiliation. 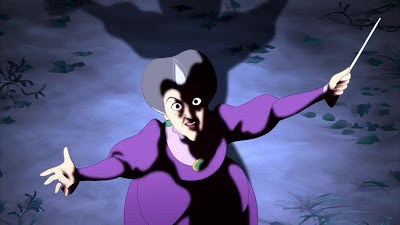 Least happy of all is Cinderella's wicked stepmother, Lady Tremaine (Susanne Blakeslee), whose fury at knowing that the girl she hates more than all other beings put together - and since she is made out of pure hate, that's quite a lot - is in the palace has sat ill with her this past year. I'm a princess and a wife"
You know, just in case you somehow haven't noticed the lessons that Disney wants to impress upon our daughters. Having witnessed the secret of Cinderella's abrupt transformation from miserable, abused servant girl to prettiest girl at the ball, Anastasia does as a slovenly handmaiden to a domineering mother must, and hands the wand to Lady Tremaine. And here is where the movie becomes awesome. Apparently realising that the only thing keeping her from the very tip-top of the Disney Villain Leaderboards is that Maleficent, Ursula, and the Wicked Witch are all magic users, Tremaine steps into her birthright as Disney Villainess, and so does Frank Thomas's extraordinary triumph of animating a totally human character whose wickedness is of an entirely, horrifyingly relatable sort, turn into a ridiculous, over-the-top parody. 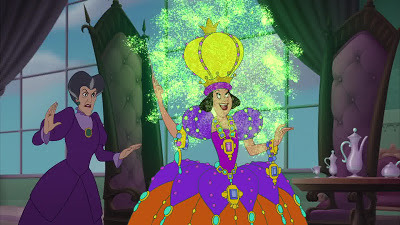 That sounds like I'm being judgmental, so let me walk that back: though obviously, the villainy here is of a monumentally different and lesser sort than in Cinderella, I kind of adore the new, magic-wielding Lady Tremaine. A Twist in Time is so damn eager to be every Disney movie other than Cinderella it's kind of delightful, in fact, and the ludicrous injection of supervillain sorcery is a perfect fit for the movie this is, rather than the movie we might have expected it to be. Case in point: Tremaine's plot is the most overworked, complicated thing it could possibly be. Instead of just, for example, turning Cinderella into stone and making the Prince fall in love with one of her daughters (and we know that it can do that; the fairy godmother herself is accidentally made a statue), she decides to go back a year and a couple of weeks, to the day that the Grand Duke (Paulsen again, not hiding his voice all that well) went door to door, trying the famous glass slipper on various women's feet. Instead of Cinderella arriving after her stepsisters have bombed out with her own spare slipper, Tremaine enlarges the first show to easily slide over Anastasia's grotesquely oversized feet. So it is that the more tender-hearted of the stepsisters - a complete retcon from the original, but one consistent with the now-discarded Dreams Come True - ends up engaged to the prince, who is put under a bit of a spell anyway, once he realises that, faulty memory or not, she's certainly not the girl he danced with the night before. Only the three Tremaines have kept their memory from the original timeline, but Cinderella and the mice know that something has gone wildly wrong, and start to assemble the pieces. 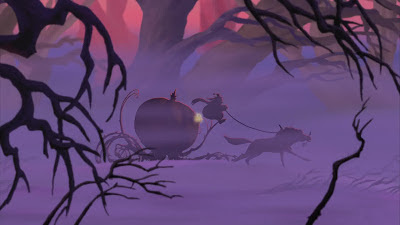 The bonkers anything-goes feel of the movie carries it a long, long way; it might not be an effective movie in its own right, and it's decidedly awful as a sequel to Cinderella, but it's as delightfully, memorably bent as all of its DisneyToon colleagues put together. It is, at a minimum, fun to watch; occasionally because it is clever, frequently because it is dumbfounding. But it's never, ever boring, and that is something rarely true of these sequels. All of this is not quite the same as calling it "good", because it isn't necessarily. It has a lot of problems: the joylessly anodyne songs, for starters. The look of the thing is also really difficult to get one's head around, far worse than Dreams Come True. Basically, A Twist in Time finds Disney's '50s aesthetic mashed up with its '90s aesthetic, and no middle ground is ever struck between the two points. 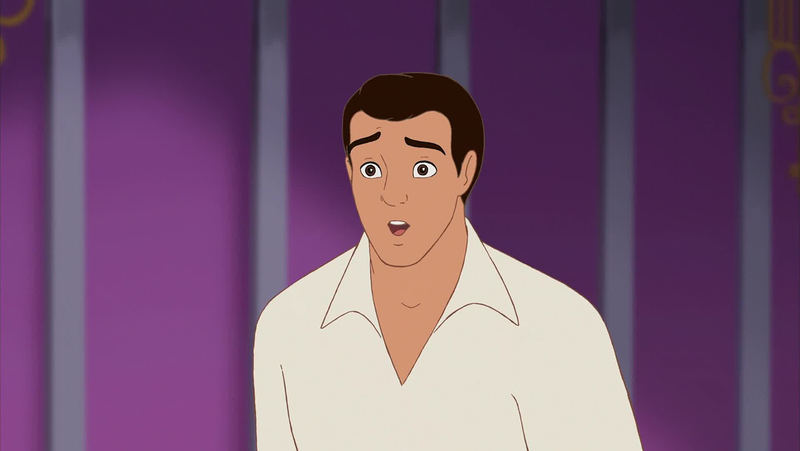 Some characters (Anastasia, Drizella, the mice) are left largely unchanged from their original character models, but given the sort of emotional expression uncharacteristic of such comic figures in a Silver Age Disney movie; others (Cinderella especially, Lady Tremaine less so) are more or less redesigned completely to take advantage of the different priorities of latter-day Disney animation. 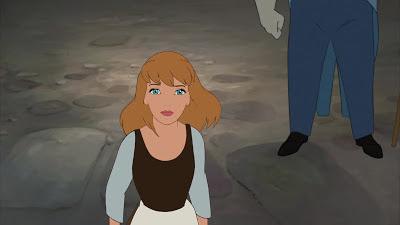 There's a lot of Ariel and, surprisingly, Esmeralda from The Hunchback of Notre Dame in our new Cinderella, and it makes her look ineffably weird, to anyone who has the original incarnation of the character memorised. Nothing can even start to compare with the poor, deformed prince, who combines the worst of the bland original character model and the worst of the new, marginally less bland princes of the '90s; that he's voiced by the same man who played the especially tedious prince in The Little Mermaid only emphasises the connection. All of this collides in a monstrous failure of design and animation that looks like a nightmare of a walking, talking Ken doll. There's still quite a lot of polish on the film's visuals, though, and for once, DisneyToon's insistence on oversaturated, poppy colors feels more or less in keeping with the world of the film. No longer a Mary Blairvian world of gentle Euro-inflected watercolors; A Twist in Time takes place in the physical embodiment of the Disney Princess franchise, all grand, glossy interiors and eye-searing lighting and bright, show colors. Or maybe not that bright, not always. 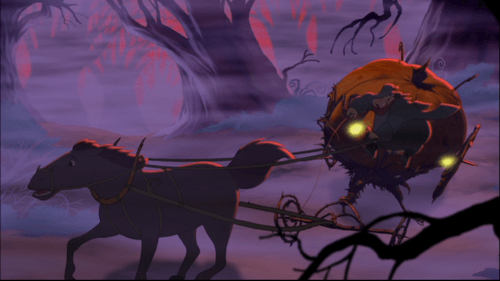 The film looks like a cartoon, I guess I mean to say, and not remotely "an animated feature", but it looks like a cartoon in a generally rewarding way. 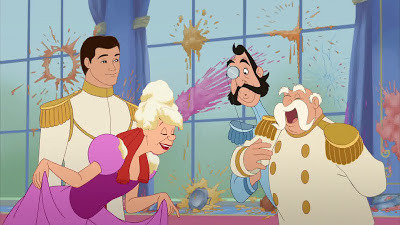 The film is, when all is said and done, basically a sugar rush: dizzy nonsense in the plot, totally un-nuanced imagery, flighty vocal performances that at no point take anything remotely seriously (except for, at times, MacNeille's Anastasia). It has a hell of a drive to it, though, and even if making Cinderella an action heroine, which this film does, makes no damn sense, its failure to make sense is arresting and joyful. Can't say that for nearly enough Disney sequels, now can we?